Work groups within IEEE, 3GPP, and other standards developing organizations are currently scrambling to define new specifications for the design and planning of millimeter-wave (mmWave) systems. All the while, there is consensus throughout the wireless community that existing channel models in this frequency regime are either unreliable – often retrofitted from sub 6-GHz legacy models with mmWave measurements – or insufficient – propagation is not fully understood despite significant efforts, especially in the past three years, to characterize the channel. Apart from the open literature, we know of commercial stakeholders such as equipment manufacturers and service providers who have taken measurements to generate their own models. Due to the expense involved, their results are held proprietary and for internal consumption only; in the best case, they are discussed to a limited degree in closed standardization fora. Through measurement campaigns with our own custom state-of-the-art channel sounders, the aim of this project is to furnish the wireless research community with advanced mmWave propagation models to help stakeholders bring finalized products to market as efficiently as possible. Each point of the synthetic array is digitized separately, enabling the use of advanced super-resolution techniques. While our synthetic-array channel sounder enables a very high degree of precision in parameter estimation, it is very slow: a channel sweep requires 44 minutes and so only static environments can be characterized. To meld the speed of the switched-array system with the precision of gridded elements, our next generation of channel sounders implements real phased-array antennas. The figure below shows our 60-GHz phased-array channel sounder. While slower than the switched array, it is steerable and its beamwidth is tunable, with nominal 3.6 ° beamwidth and 28-dBi gain. Each board can scan 90 ° in azimuth and so to enable an omni view, the boards are arranged at right angles at both the RX and TX. The beam pattern can be switched at a rate of 30 MHz, so a full RX-TX sweep requires only 0.33 s. We have a similar phased array at 28GHz that has separate feeds for both polarizations. The precise calibration and verification methods for mmWave systems enable us to develop accurate channel propagation models for our field measurements, the main thrust of the project. We have made significant progress in characterizing path-loss models, map-based dispersion models, Doppler frequency-spread models, multipath tracking, and human blockage. Some details follow. The IEEE 802.11ay task group as well as other industry consortia have subscribed to map-based channel models for mmWave systems, of which the Quasi-Deterministic (QD) model has become the benchmark. In the QD model, the direct path and reflected paths only are considered as diffraction has been demonstrated to be much weaker in mmWave bands. The direct path is completely deterministic: its geometrical properties (delay, angle-of-arrival, angle-of-departure) are computed from the TX and RX coordinates and its path loss from Friis transmission equation in LOS. Specular reflections are also deterministic: their geometrical properties are computed from raytracing (provided a map of the environment in addition to the TX and RX coordinates) and their path loss is the sum of the free-space loss plus any reflection loss. Each specular reflection gives rise to scattering of the incident wave into a dominant specular multipath and weaker diffuse components clustered around the cursor. The stochastic property of the model concerns the small-scale statistics of the clustered scattering. We compute QD parameters such as the reflection loss of the cursors and the angular spread of the clusters from measurements. A MATLAB implementation of the model can be found here: https://github.com/usnistgov/raytracing. The figure on the left visualizes multipath tracking across 108 RX positions in a lecture room using our 60-GHz switched-array system. The TX is labeled on the map of the environment while the ground-truth (reported from robot) RX positions are marked with Xs. 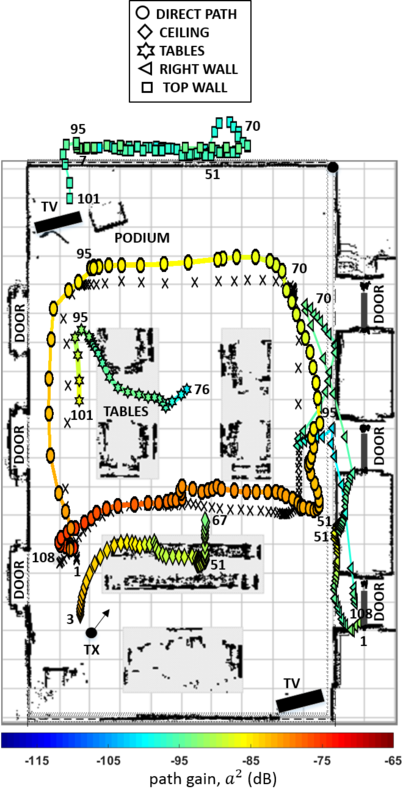 The dominant paths were tracked on the map: the direct path was estimated as the position of the RX while the reflected paths from the ceiling, tables, right wall, and top wall – each marked with a different symbol according to the legend – were estimated as the location of their reflection points. Each symbol is color-coded against path gain. For the direct path and right-wall reflections, the paths were detected for all RX positions while for the other three, only segments were detected. Accordingly, the beginning and end positions for each path were labeled. The three waypoints where the robot turned (positions 51, 70, and 95) are also labeled for reference. Device-to-Device (D2D) models at mmWave will suffer from blockage from humans, vehicles, etc. given the low base-station height. From our observations (figure below), as well as many others, the slow fading (shadowing) of human blockage will range between 20 – 25 dB. While significant, the signal may still be recoverable for data transmission depending on the link budget. That is why – while the vast majority of papers only report on the slow fading – fast-fading characteristics of the blocked signal are also important, yet still lacking in literature. This is the subject of our current analysis. We have equipped our mobile robot with ruggedized wheels so that we can conduct measurement campaigns outdoors. We have expended significant effort in getting our location services operational outdoors via precision differential GPS, which delivers good long-term accuracy, coupled with an Inertial Measurement Unit (IMU), which delivers more stable short-terms accuracy, especially for heading, but suffers from long-term drift. Because the heading serves as a reference for our angle estimation, we fuse the GPS and IMU through Kalman filtering to deliver sub-degree heading error. We are also currently in the process of procuring a GSA van for high-speed vehicular measurements. We have collected data in downtown Boulder and other measurements slated for the upcoming year are in urban-canyon Denver and at Union Station. In the grand scheme of things, our intention is to extend the indoor models we have developed for path loss, dispersion, Doppler frequency, and multipath tracking to outdoors. The purpose of this paper is to develop methods for comparing different channel sounders, each with differences in filtering, scaling, and other post-processing techniques. We explain cutting-edge calibration, verification, and measurement techniques specific to mmWave channel sounders. The 111-page complete document is currently authored by 25 experts from 13 different organizations worldwide and is ready for submission for book publication together with the modeling white paper (below). The purpose of this paper is to provide cutting-edge modeling techniques specific to mmWave wireless systems. The document has grown to 168 pages authored by 18 experts from 12 different organizations worldwide. The website (https://5gmm.nist.gov/) was launched in December 2016 and serves as a repository for contributions of measurement data and models for mmWave channels. By aggregating data in multiple environments across multiple frequency bands, data can be compared, contrasted, and validated; in addition, the data can be used for modeling research for institutions that do not have the resources to collect data on their own. Thus far we have a total of 53 data-set submissions from five different organizations. A new item for FY19 will be to deliver our first channel model, for the urban-canyon environment at 28-GHz center frequency. Thus far, we have formed a subgroup of seven institutions (USC, NCSU, Ilmenau TU, NYU Wireless, Durham University, and NIST), each with outdoor channel sounders in this frequency band. The channel model will be derived from measurements collected in different cities by the different entities and, as such, will be have broad representation. We also expect many more Alliance members to contribute data and models to the repository. Finally, we expect to continue to host one or two workshops per year.